DHL is the leading global brand in the logistics industry. The DHL family of divisions offer a portfolio of logistics services ranging from national and international parcel delivery, e-commerce shipping and fulfillment solutions, international express, road, air and ocean transport to industrial supply chain management. With around 360,000 employees in more than 220 countries and territories worldwide, DHL connects people and businesses securely and reliably, enabling global trade flows. With specialized solutions for growth markets and industries including technology, life sciences, and healthcare, energy, automotive and retail, a proven commitment to corporate responsibility and an unrivaled presence in developing markets, DHL is decisively positioned as “The logistics company for the world”. However, I wanted to find out more about how the company has been transformed by technology. I also wanted to explore how DHL invests and looks after their people to deliver amazing results. 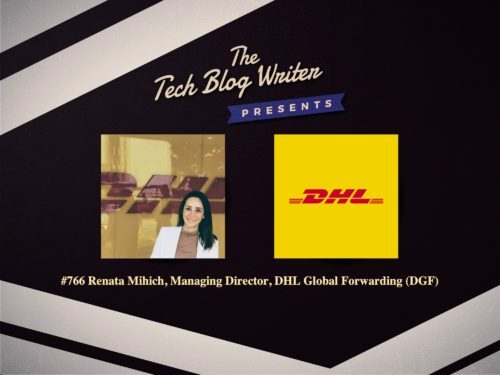 DHL’s Renata Mihich is the managing director for DHL Global Forwarding (DGF) in Canada. She has an interesting and compelling story about her 20+ year career with DHL, which started in customer service in Brazil. She’s moved up the ranks ever since to head up a major sector of the company in Canada. Responsible for a staff of 350 people, Mihich manages the operations and P&L growth of all six Canadian DHL Global Forwarding branch operations, steering the overall development of country sales teams. Under her leadership, she has successfully steered the DHL Global Forwarding Canada group towards executing group strategy and achieving expected results. I invited her onto my daily tech podcast to learn more about her success story and how DHL is embracing rather than fearing technology.